In recognition of a benchmark year for the Breedekloof Wine Valley, its wineries will be celebrating 2016 with a month of festivities. From November 15th to December the 17th, visitors to the picturesque Breedekloof Wine Valley will encounter the true generosity of its people, as each of the wineries will host and spoil visitors with a range of activities, which include picnics, delicious food offerings, unique food and wine pairings, craft beer and gin tastings, lucky draws and more. Of course visitors will be poured unique and award-winning wines from the wineries’ cellars where they will be able to enjoy these in what is definitely one of South Africa’s most dramatically beautiful wineland settings. During this period all wineries will offer free wines with purchases of 12 bottles of wine and more, with additional activities offered by the various cellars. Visitors who would like to plan their itinerary to include a visit to the Breedekloof Wine Valley during the ‘Celebration Month’ between 15 November and 17 December can get in touch with the Breedekloof Wine Valley Tourism Office by contacting info@breedekloof.com or 023 349 1791. Enjoy a festive atmosphere with el-fresco style lunches on the beautiful lawns and great Christmas gifts for your loved ones. Contact 023 344 3021 for bookings. Test your taste buds with a vertical tasting of this winery’s award-winning Chardonnay’s across various vintages, while enjoying live piano recitals on 3, 10 and 17 December. They will also be offering delicious Chenin Blanc fondue, as well as a free bottle of wine with every six bottles purchased. Contact 023 355 1603, for bookings. Visitors are invited to enjoy educational wine tastings, spot prizes, with special care taken of little ones with wine gums and grape juice tastings, as well as Wine & Vine educational tractor rides bookings essential by contacting 023 355 1740. Famous for producing a range of seriously delicious wines, this winery also prides itself in producing interesting wines from unusual varieties. All of which will be offered to visitors for tasting during the Celebration Month. Visitors are also invited to enjoy wood-fired pizzas and beautiful sunsets on the deck at the popular Melissa’s deli – where happy hour on Fridays means 20% on your bill on purchases made between 17:00 and 19:00. Contact 023 349 1601. Visitors looking for interesting wine pairings will be able to enjoy a cupcake tasting matched to the estate’s ‘Cupcake Wine’. Being a family destination, the Breedekloof Wine Valley caters for all – kids can enjoy a cupcake and cranberry juice tasting. Saturdays you can also enjoy the Broers Brew Beer on tap. Join Kirabo Private Cellar’s wine experience on 26 November as they take your senses on a wine journey. You’ll start off with a wine tasting, followed by a fun blending experience. 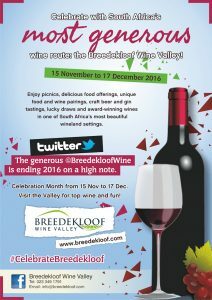 While on 03 December you can enjoy a Wine, Beer + Dessert Tasting as part of Celebrate Breedekloof month. There will be food and other refreshments to buy on the day. For bookings and pricing, email info@kirabocellar.co.za or contact 071 681 9019. In addition to the promotional free bottle per case of wine, during the celebration month, visitors will be able to buy the flagship, Livia’s Laughter MCC 2011 for only R100 a bottle. Contact 082 378 3575. Indulge in cheese platters at this sixth generation wine farm. This winery has also committed to sharing some of its traditional family recipes with visitors. Guests will be treated to a recipe booklet with suggested wine parings alongside. For bookings and more details contact wines@merwida.com or 023 349 1144. Discover your inner mixologist and mix your own cocktail in the tasting room, enjoy cheese and wine pairings, or opt for something with more sustenance with the ‘Twitter, Chatter and Clink’ (‘Kwetter, Kletter & Klink’) – menu, served every Saturday on the estate’s lovely veranda from 11:00 to 15:00. For bookings contact wine@opstal.co.za or 023 344 3001. Enjoy a truly unique tasting and vineyard experience by booking a behind-the-scenes tour with the wine team. Contact 023 342 0401. Enjoy a delectable welcome drink when you visit this cellar. Feeling lucky? Buy 12 bottles of wine and be entered into a lucky draw on 15 December – and stand a chance to win a Magnum sized bottle of Shiraz, or if you are truly lucky, the bigger, Jeroboam-sized bottle of Shiraz. For additional details contact 023 344 3026. Enjoy an interesting twist to wine enjoyment with this winery’s welcoming drink: a Moscato-wine slushy! For the more adventurous visitor there will be a sweet and savoury fondue paired to wines from this cellar and a “pop-a-balloon” with a variety of prizes to be won. Bookings essential for the fondue. For pricing and bookings, email info@uniwines.co.za or contact 023 349 1110.